Search for calls by entering search criteria such as time, date, telephone number, extension or DID. Additional filters such as duration, notes added to recordings or account codes entered during a call are also available. 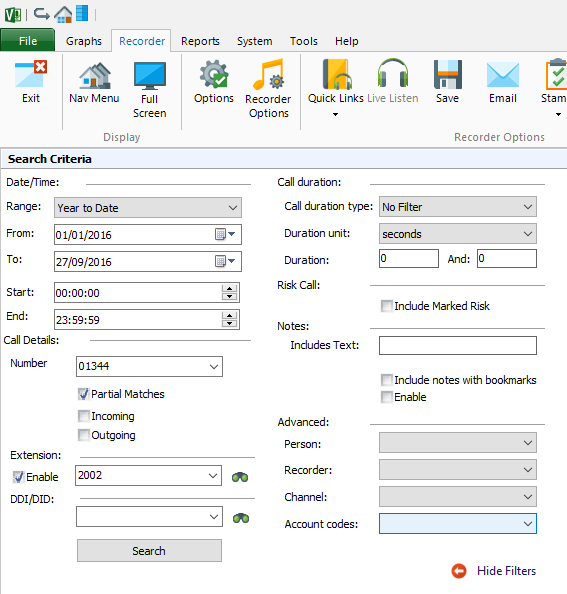 Call recordings that match the search criteria are displayed along with relevant information for that recording. Double click a recording to play it back or right click for further options such as save locally, email or view/add notes. Where call recordings are used to enhance staff training, play lists of calls can be created for future access. 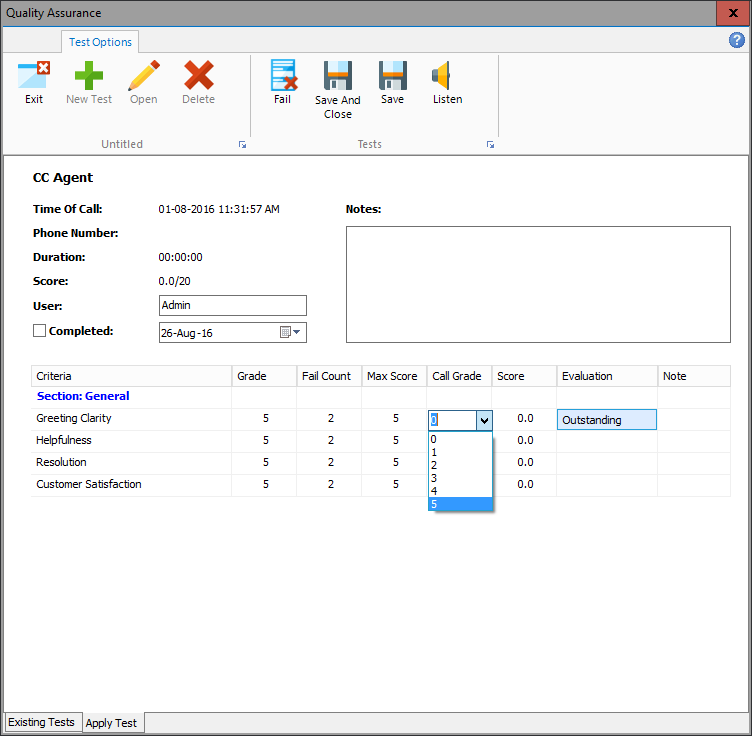 Whereas the Office Compact allows a star rating between one and five to be added to a recording, the Office Ultimate provides the ability to score calls against predefined lists of questions and scores. This allows a training history to build up for agents through the output of detailed or summary reports. 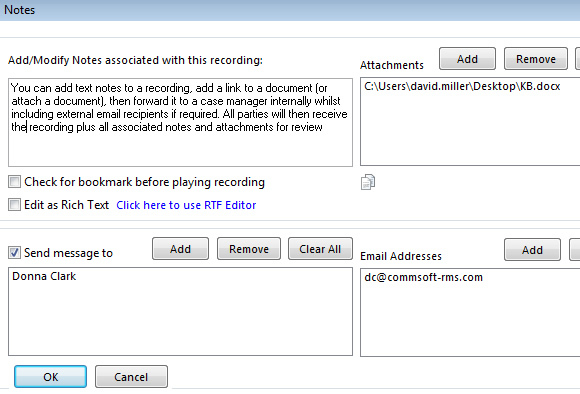 Notes can be added manually to a call recording in the Office Compact, but the Office Ultimate expands on this theme by allowing the attachment of documents (or links to documents) as well as notes in order to send the complete package to an internal or external supervisor for review. The supervisor can then review the recording plus any notes or attached documents before responding. 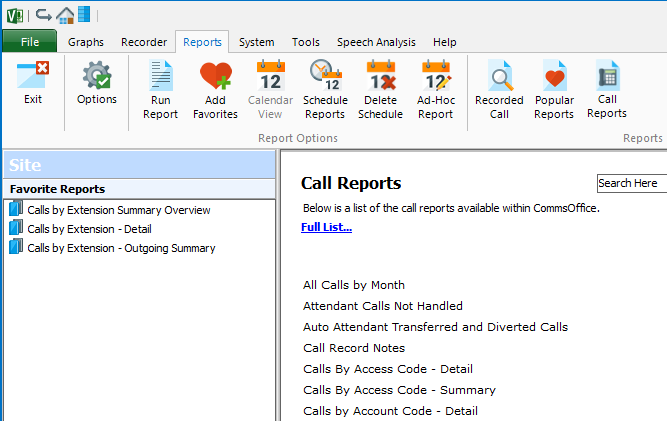 There are currently 175 call logging reports available as standard with the Office Ultimate. This is a significant increase on the 35 reports available with the Office Compact recorder. Reports can be run on demand or set to run automatically to a predetermined schedule. A full list of all the reports can be found here. A “Call Logging” connection to the PC or server being used. 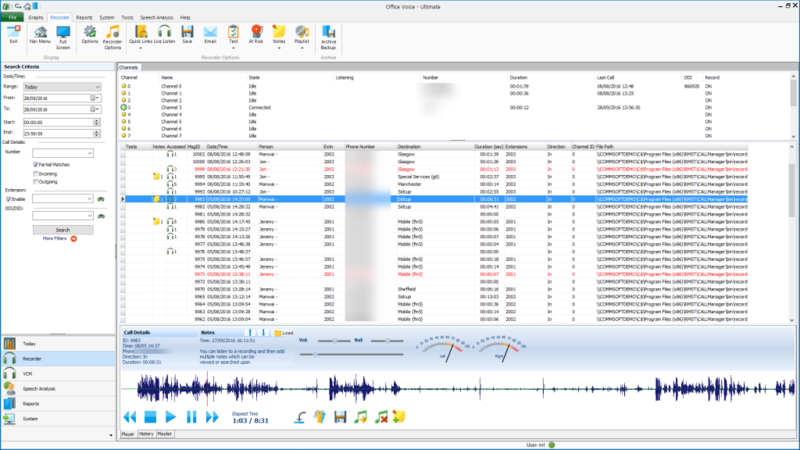 An “Audio Recorder Channel” connection for each line or extension to be recorded. Call Logging – can be; RS232 serial port or Telnet via LAN or IP via LAN or via text file reader – (call logging is required for reporting and call tagging). Null Modem lead required for serial connection from telephone system to PC, Cat5 straight patch lead required for Telnet & IP connection. Audio Recorder Channel – Recorder card, line and extension connections are via a high impedance parallel ‘TAP’. SIP and VoIP recorders use a mirror port as shown in connection detail.